Apparently spring is upon us. I looked out an our mint has gone absolutely crazy. It was Sunday, the weather was fabulous and the only choice B and I had to make was how to drink some mint. No problem. Mojitos. We were headed in that direction when B decided a small course adjustment was in order. We had tried a drink from Imbibe call the Benton Park Swizzle. It’s a riff on the Queen’s Park Swizzle by a guy named Ted Kilgore at a place called Taste Bar by Niche in St. Louis and substitutes Fernet Branca for the usual Angostura Bitters. Muddle the mint and sugar cubes (The original recipe calls for 1 oz simple syrup, but I think the sugar crystals help with muddling the mint) in a rocks glass or measuring cup until the mint is a fine paste. Add the rum and stir. Add the lime juice and stir. Fill a tall Collins glass 3/4 full with crushed ice. Strain the rum/juice/mint mixture through a tea strainer into the Collins glass. Put a long bars spoon into the glass; take the handle between your palms and twirl it back and forth, moving it up and down, until the cocktail is well mixed–this is called swizzling. Top the glass up with more crushed ice as needed. 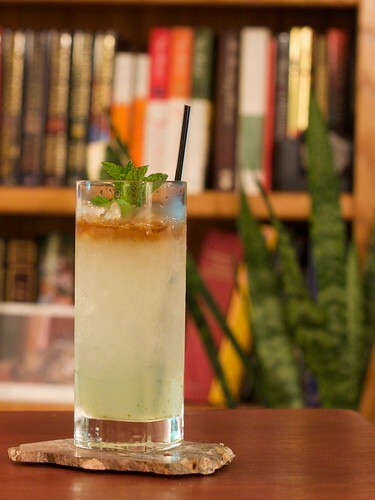 Float the Fernet Branca on top, and add a sprig of mint and a straw. The Fernet Branca at the end can take a bit of getting used to, but it adds a nice complexity to the finish. With summer getting close, we should take the Queen’s Park Swizzle out for a spin at some point (with out mint supply, it shouldn’t be a problem). The swizzles, with a glass full of crushed ice and citrus/rum goodness, are a great concoction for the hot days of a California summer. Fernet Branca is a liquor of the Italian amaro, or bitter liquor, family with very strong flavor of eucalyptus. It’s the subject of a Bill Cosby routine and a hilarious commentary by the duo of EducatedDrinking, who get increasingly blotto as the commentary progresses. Apparently it’s good for indigestion, cramps and whole host of other ailments. The name swizzle, comes from the technique of using a swizzle stick to mix the drink. The original swizzle sticks (unlike the plastic eye-pokers of today) were cut from the Caribbean Quararibea turbinata tree and looked like a stick with a series of short spoke-like branches at the bottom for mixing. 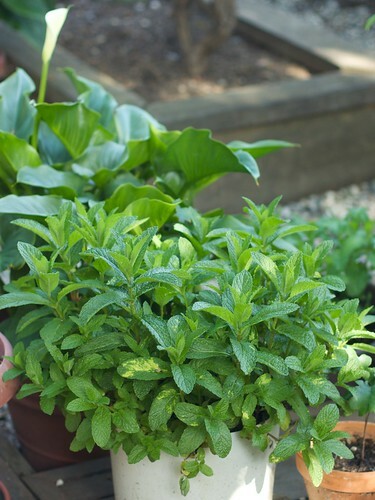 From the looks of your mint, I see a lot of mojitos and Benton Park Swizzles in your future!